It’s been 30 days since we sold everything in Toronto, and joined van life. And, frankly, time has been flying by. You know those rickety wooden rollercoasters that don’t go upside down or have any crazy corkscrews? They’re not exactly scary, but you’re always wondering if the bolts have been tightened lately, or if the wood didn’t look just a little bit too corroded on that pole you just passed. Well, our first month of van life was a lot like that. All the excitement that comes with exploring a new land, but also: several sleepless nights as we learned the challenges of stealth camping; many fits of rage as we ripped apart the cupboards and drawers to get at stuff we “swore we put in there”; and one unexpected but not serious run-in with a metal parking arm (we didn’t know the radio worked until the antenna broke off anyway). Yup, that’s van life, ever testing our adaptability to adapt. Well, guess what. We’re flexible little buggers! You’re going to have to do a lot worse than that! Here’s a look back at the ups and downs that were our first month on the road. We discovered really cool cities that we didn’t realize were cool. Work isn’t 9 – 5, and our office is anywhere with wifi. Where there’s wifi, there’s a way. Whether we’re at city cafes or on a blanket next to the rangers station at some sprawling national park–even in Meat Cove, the most northernly point in Nova Scotia–we’ve been able to find a decent connection. Though, sometimes, a last-minute project comes up, and you’ve just gotta work from a park bench. Some days our bedroom is a pristine national park, and others, behind an abandoned building. Stealth camping days feel great because you’re not shelling out cash at a campground. But it can be nerve wracking–our overactive minds waking us with every set of lights that drive by–and tricky to find somewhere quiet and dark to park for free. We’ve had a handful of sleepless nights so far. But we recently met a couple who’ve inspired us to be more confident with stealth camping and to just ask for tips from people you meet. And same with our dining room. Every meal is both “to go” and “for here” when you live in a van. We discovered early on how important it was to have nutritious and filling snackable food in the van, especially while driving. Hanger has real skill for sneaking up on travellers, doesn’t it? Bugs. There are a lot of bugs. We’re becoming bug whispers. Ticks, moths, caterpillars who live in caterpillar condos. Oh god, they’re everywhere. Are they in our hair!? Omg. #Ticks. So many ticks covering our pant legs after a hike through the meadow. Watch us count ’em (and kill ’em) on #Snapchat. We’re drinking a lot of americanos (send Crest white strips!) in the quaintest little cafes. Starbucks who? Yeah, there’s a piece of content that we need to write: where to find the best wifi and coffee in Canada. We’re experts now. Most recently, we were at the Frog Pond Cafe in Cheticamp (we ate all the gluten-free, dairy-free, sugar-free energy balls–huge props for that awesome healthy snack), and at Downstreet Coffee in Inverness where they steamed almond milk and brought it to our table. The Dancing Chicken in Liverpool and the Wired Monk in Halifax also won our hearts with welcoming staff and quality product. Work sent us to New York for a few days. TBH, it totally felt like we were cheating on #vanlife being in NYC at a cool, third-story walk-in AirBnB. But it was so worth it. We love New York City. It’s hot, muggy, gritty, and so inspiring. We worked in partnership with Digital Viking, and The Entrepreneurship Society to make some content, meeting bunch of inspiring Canadian entrepreneurs, investors, and cool New Yorkers along the way. Plus we met up with some smart friends for some good convo. We’re still eating like g’dang kings. Navigating has been the root of 99 per cent of our arguments. So we bought a TomTom GPS at Walmart in rural Quebec. En route from #blomidonprovincialpark the South Shore this morning to see our mechanic. Getting a Thule installed on the roof, so we don’t have to keep transferring bags from the back to the front every time we want to sleep. We’re also having a tuneup done. Will Vanny McVan Face end up with a new engine? We’ll know in a few hours… And so will or wallets. We’ve had some epic runs. We’re not waking up and doing sun salutation every am, but we do have the luxury of running, hiking, and strength training wherever the road takes us. Yeah, we’re bench pressing pines trunks now, braw. A lot of hilarious moments are captured on Snapchat. Love it or hate it, Shapchat has been a solid outlet to share our adventure. Come, follow along @lietco! If you’re not entertained, we’ll send you a seashell. Or a sea stone. Lisa has collected a lot of those. Parts of Canada have been a lot colder than expected. Canada Day was perfect, sunny and 30 degrees in Cape Breton. But three weeks before in Quebec City, we were wearing winter hats. We layer, and we layer often. Learning how to organize everything is time consuming. Like, this hanging fruit basket is wonderful. Until you realize that your tomato has exploded from banging against the window while driving. There are so many kind, wonderful people out there. Like Carolee and Richard from Prince George, whom we camped next to in Baddeck. They gave us a plate full of warm, chocolate chip banana bread, and to Lisa, a pair of pink handmade boiled felt slippers (which, she has yet to take off). There was Lisette in Brockville, Ontario, who left a handwritten note on our windshield, encouraging us to attend BusFusion. And Carol and Paul from Maryland, a retired couple, who promised to share all the inside tips when we get down to New Orleans in the winter. Boy, we sure do make a lot of social media, don’t we? That’s a slice of 30 days, anyway. Thanks for reading, and as always, feel free to reach out with any questions, suggestions, or confessions. 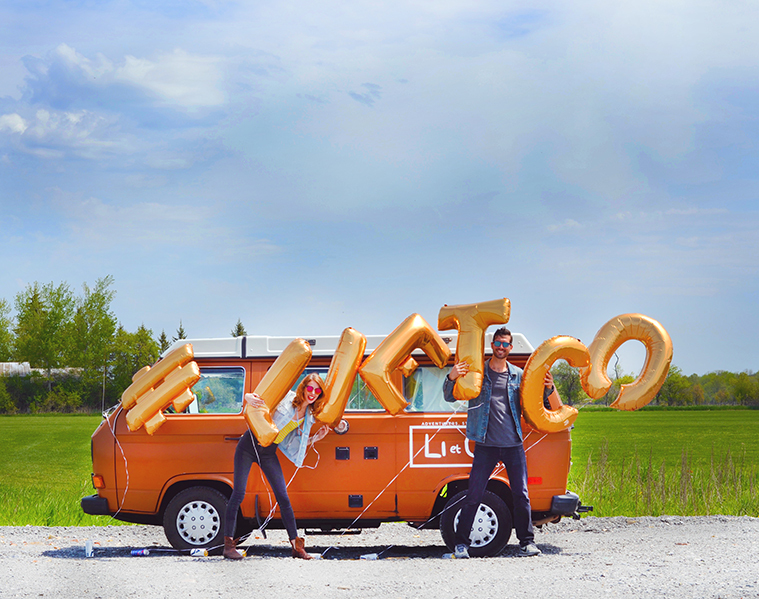 Lisa Felepchuk and Coleman Molnar are the founders of Li et Co. Hi. You know us. We’re tall and like to run and eat good food with good friends... and we just bought a van.